Many businesses have found that their Facebook organic reach has been declining. Just between January and July 2016 publishers saw a 52% decrease in organic reach according to Social Flow. According to Hubspot, “a Page with 10,000 fans could expect just 650 of them to actually see that Page’s posts in their News Feeds. For a Page with 1 million fans, about 20,000 would end up seeing posts.” With 60 million businesses advertising on this social media platform, how does the average company compete (without paying Facebook to boost the visibility of a post)? Take a perusal at your Facebook analytics (if you haven’t or don’t know how contact us at Guardian@SEOversite.com) — it is nearly certain that you, too, have fallen victim to this trend and your organic reach has declined. Why is this and how does one counteract it? Facebook’s algorithm is designed to prioritize posts from family and friends, followed by educational content and entertainment, without leaving much space for your post about your newest line of products. In fact, posts that are purely promotional hold very little weight and are unlikely to even be seen by the majority of your business page followers. Read on for our full list of tested methods to outsmart Facebook’s algorithm. Clickbait is not the answer long-run. There are, however, five best practices you can follow. An engaging social media feed also offers a wide breadth of content, and creating in-house videos for all posts would be too much branded content, boring your audience. This is where curated content comes in. Curating posts simply means scouring the internet for content posted by others that your viewers will find engaging. While many businesses assume it is a mistake to use limited news feed real estate for anything other than directly promoting their business, curated content from other feeds adds variety, makes your feed more palatable, and is more likely to be shared, exposing your brand to a wider audience. By combining entertainment (in this case a dentist singing along with an Ed Sheeran song) with education (the actual meat of this being to brush your teeth and floss daily in order to have proper oral hygiene), a popular song is combined with relatable content that led to HUNDREDS OF THOUSANDS of likes, shares and comments from viewers, truly going viral. There are no shortcuts to increase engagement. Facebook recognizes when you are trying to cheat, including when you use clickbait. Clickbait posts often feature headlines like “You’ll never believe what happened when…” and “This is the biggest mistake you can make…”. Once clicked, these posts contain little to no useful content. 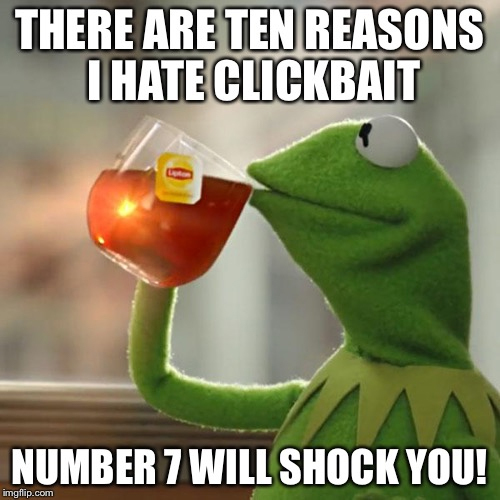 You were baited, you clicked, that’s clickbait. Facebook tracks the amount of time spent reading an article or viewing a video. If users click away quickly, Facebook will take note and respond by decreasing the visibility of that post and all future posts from that business. If you have a dedicated team, trained to create and curate superb, engaging posts without the need to cheat, your Facebook business page won’t soon be forgotten. The number of viewers your posts reach drops with each additional post — especially if you are posting more than three times a day. Facebook reacts to this in the same way it does to clickbait, by reducing the visibility of your posts. We have found an average of 2-3 posts per week is enough to keep your audience engaged without overwhelming them. Posting times should be randomized outside peak hours, but while your followers are still online. We would highly recommend personally testing this for your own business page as success can vary between demographics. If your target audience is stay-at-home mothers, the times that they are active on Facebook will be different than millennial young professionals. Posting at the same time every day will make Facebook’s algorithm flag you as spam and reduce the visibility of your posts — so make the timing of your posts less consistent. While the above guidelines have been found to significantly improve organic post performance, testing and experimentation is required to achieve optimal results. If you don’t have the staff or experience to do this on your own, find a dedicated social media team who is always abreast of the constantly changing algorithms. iScreamSocialMedia assigns you a dedicated Social Media Manager, with a team of experts to back them up, who will help you create and curate unique content for Facebook, Instagram, Twitter, LinkedIn, and Google+. Pre-scheduling each month’s worth of content before the month even begins in a convenient and easy to navigate social media calendar, sent to you for approval before posting. To learn more about iScreamSocialMedia and find out how we can help you build your social media presence reach out to GetTheScoop@iScreamSocialMedia.com or call 305-455-0720. To see more of iScreamSocialMedia’s work, check out our Instagram Page or any of the SEOversite feeds — Instagram, Twitter, Facebook, and LinkedIn.